Nashville Ballet is celebrating 10 years of Nashville’s Nutcracker early with Christmas in July! For the entire month of July, Nashville Ballet is offering a special $5 off ticket* discount to Nashville’s Nutcracker with promo code XMASJULY, which provides the best single ticket prices all year. Celebrating 10 years of awe-inspiring magic and dazzling holiday cheer, Nashville’s Nutcracker will ring in the season with 16 performances December 2-23, 2017, at TPAC’s Jackson Hall. In honor of its 10th year in Nashville, the production will debut additional characters and all-new magical elements. Nashville’s Nutcracker follows the classic adventure of young Clara and her enchanted Nutcracker with clever nods to Music City’s notable history, landmarks and characters. To mark the occasion, the Nutcracker and Mouse King will make special appearances at various locations throughout the city during Christmas in July. On Thursday, July 13 from 11 a.m. - 2 p.m., the public is invited to TPAC (505 Deaderick Street Nashville, TN 37243) to meet the characters, purchase discounted Nashville’s Nutcracker tickets* on-site and save on ticketing fees (up to $10 per ticket), and buy Nutcracker and Mouse King dolls. The event coincides with Nashville’s weekly Street Food Thursdays event on Deaderick Street and 4th Avenue North, next to TPAC. National Dance Day at Nashville Ballet (3630 Redmon Street Nashville, TN 37209) on Saturday, July 29. During their appearances, the Nutcracker and Mouse King will encourage children ages 7 (must be born in 2009) to 11 years old to audition to perform in Nashville’s Nutcracker this December. This is the only opportunity the general public will have to perform on stage with Nashville Ballet and the Nashville Symphony this season. Open auditions will be held Sundays between 11 a.m. - 3 p.m. on August 20, August 27 and September 10 at Nashville Ballet. No dance experience is required. *The Christmas in July discount is valid for Price Levels A, B and C (offer excludes Saturday and Sunday matinees). 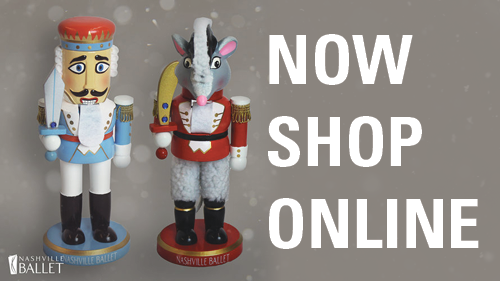 Discounted Nashville’s Nutcracker tickets can be purchased online here, at the TPAC Box Office or by calling (615) 782-4040. Use promo code XMASJULY when purchasing to receive the discount. Single tickets for all other 2017-2018 season performances are also on sale to the public beginning July 1. The Christmas in July discount only applies to Nashville’s Nutcracker. For an even better savings, buy more ballet and receive 50% off children’s tickets and up to 30% on adult tickets.